So after 6 years and with no off season trickle charging, my own fault but the battery was strong this whole time, my OEM battery is dead. I charged it to get her up and running but looking for a replacement now. My assumption is charging it is only delaying the inevitable, so any thoughts on a decent replacement? Or just grab another OEM. Clutch, 6 years out if a battery ain't bad! You might (??) 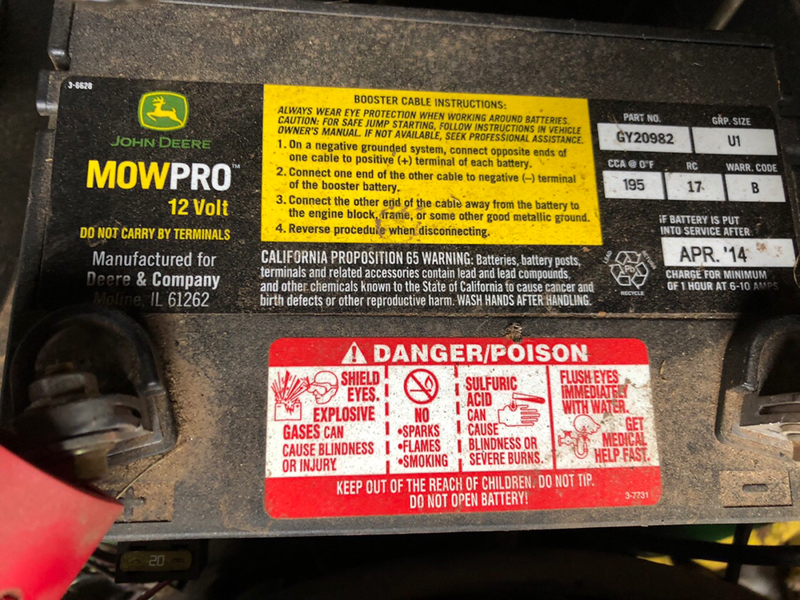 get another year out of it by repeatedly charging or it may just stop on you...some tractors will run off of the charging system and some stop dead when the battery dies. Not trying to tell you what to get, but I'm just stating facts. I have 2 Walmarts that are over 6 years old, but they are indeed about ready to need replacement. I have occasionally tricked charged them though. Agreed, six years is plenty for a battery. My first OEM battery in the LA140 lasted four years. I replaced it with a Deere "StrongBox" battery, which is a step up from the original one provided with the 100-series. I got seven years out of that one. The StrongBox was more money, but I thought it was worth a shot, and I'm satisfied with how long it lasted. Now I'm trying a cheapo box store lawn tractor battery for comparison. It survived the winter and seems ready for a second season; it has already started the tractor successfully. It was less than half the cost of the Deere StrongBox battery, so it will still work out financially even if it doesn't last more than three years. Find the least-expensive lawn and garden battery that you can find. If you are near Costco, they carry an Interstate one for about $33. Just make sure that you are getting a fresh battery, and not one that's a year old that's been sitting on the shelf for the past year w/o being charged. There is usually a date sticker, and also the alphanumeric date is burned into the side of the case (google-image "battery date code") if you can't find the sticker on it. Buy the freshest battery that you can find. I've also found that in many cases, the seal between the top of the case and the terminals on these small lawn-and-garden batteries is not very good, allowing acid to creep up onto the terminals and corrode them. So what I do when I get a new battery, is to take some sort of sealant (silicone RTV, Permatex #2, or whatever I have handy at the time), and place a small bead of it all around each terminal where it comes through the case. This will keep your terminals much happier. Thanks all, I have a BJs nearby so I’ll check them out before Walmart. No issues with corrosion build up the terminals look new as the day they were bought. At the dealer I'm working with.. they sell Interstate SP35 as a replacement. Great batteries and have 300cca. I think 6 yrs with no trickle or battery maintainer is excellent. I know with automobile batteries, I've had great luck with "Auto Zone"
That's good that you don't have any corrosion, but you'll be installing a new battery which could have the issue that I described. When I get a new battery, I proactively seal the terminals so the acid can't seep out from around them. I'd say that about 50% of this size battery that I have used over the past 15 years (I maintain about a half-dozen riding mowers for family & friends) develop this leakage. How do you seal these batteries? When I get a new battery, I proactively seal the terminals so the acid can't seep out from around them. I'd say that about 50% of this size battery that I have used over the past 15 years (I maintain about a half-dozen riding mowers for family & friends) develop this leakage. I take Silicone RTV, or any type of automotive gasket sealer that I happen to have on hand (Permatex #1 or #2, aviation gasket sealer, etc) and just apply a small bead of it around the base of each terminal where it protrudes through the top of the battery case. I rinse the area with water first (to wash away any acid, if any) and then blow it dry with compressed air first.